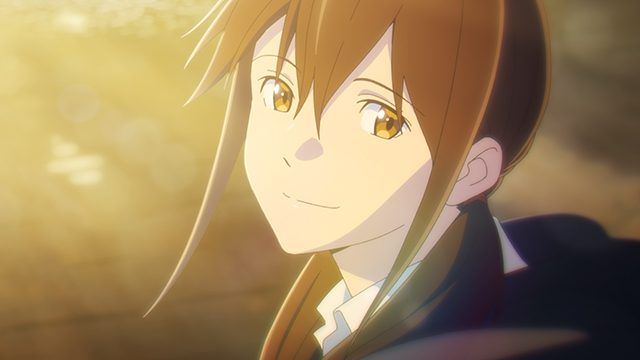 Fathom Events in partnership with Aniplex of America brings the uplifting, coming-of-age tale that has captured the hearts of millions in Japan, "I want to eat your pancreas." 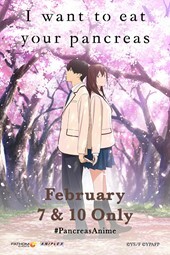 Based on the bestselling, award-winning novel by Yoru Sumino, "I want to eat your pancreas" the anime adaptation beautifully explores the relationship between the terminally ill Sakura and the unnamed protagonist, "Me," as they embark on an emotional journey during an unforgettable spring. As these two opposites try to learn to find happiness, they in turn discover the true meaning of compassion. In addition to the poignant feature, attendees will also view exclusive extra footage, including interviews with the cast and crew. Presented by Fathom Events and Aniplex of America, "I want to eat your pancreas" comes to more than 400 U.S. cinemas subtitled on Thursday, February 7 at 7:00pm (local time) and English-dubbed on Sunday, February 10 at 12:55pm (local time). For a complete list of theater locations, visit the Fathom Events website (theaters and participants are subject to change). The special two night event includes the world premiere of the English dub featuring cast members Robbie Daymond ("Sailor Moon," "Digimon Adventure tri.") and Erika Harlacher ("Fate/Apocrypha," "Violet Evergarden") voicing the two main characters, along with Kira Buckland ("Blue Exorcist," "Durarara! !x2"), Kyle McCarley ("Fate/stay night [Unlimited Blade Works]," "DEVILMAN crybaby"), and Dorah Fine ("Magi: The Kingdom of Magic") in supporting roles. Making her directorial debut is voice actress Erica Mendez from "KILL la KILL" and "Your lie in April," who has signed on to handle the voice direction in addition to composing the English adaptation of the heartwarming film. "I am pleased to be able to share this beautiful story to everyone living in the U.S.," said Aniplex of America president, Shu Nishimoto. "This film captures both the beauty of Japan's landscape as well as the beauty in growing up. I hope the film gives everyone a renewed appreciation for life and the people that shape our life choices." "I want to eat your pancreas" was produced by Studio VOLN ("Ushio & Tora") and marks Shinichiro Ushijima's ("One Punch Man," "All Out!!") directorial debut. The Japanese cast features popular actor and 72nd Mainichi Film Awards Best New Actor winner, Mahiro Takasugi, who will voice the main character "Me" alongside veteran voice actress, Lynn ("High School Fleet," "A Place Further Than the Universe"), who will voice the female lead, Sakura Yamauchi. The impressive voice cast also includes Atsuko Tanaka("Fate/stay night [Unlimited Blade Works]," "Ghost in the Shell"), Shin-ichiro Miki ("Fullmetal Alchemist: Brotherhood," "Initial D"), and three-time winner of the Japanese Academy Awards, actress Emi Wakui. "We are excited to once again partner with Aniplex of America to bring this highly anticipated title to the U.S.," Fathom Events CEO Ray Nutt said. "It is a wonderful story and appeals to people in all walks of life." 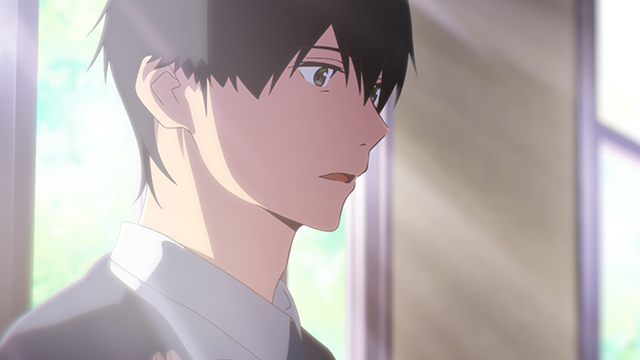 ⏩ Tickets for "I want to eat your pancreas" are available now at FathomEvents.com and participating box offices.